When it comes to summer swimming, sure, you could elbow through crowds at the beach and take a dip in the lake, but if you’re averse to crowds (or microorganisms) there is an alternative: head to a hotel. Hell, it worked wonders for that time you had to go #2. 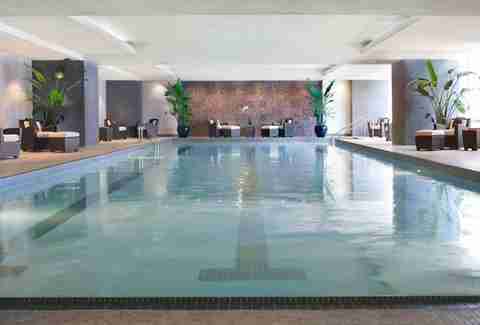 Now you may be thinking, “hotels are fancy and secure, don’t they require buying some sort of day pass?” The answer to that is “sort of.” We visited 14 top hotel pools around Chicago to see which were easily diveable and which were just plain impenetrable. How to get in: Picture this: you’ve been partying away at Lollapalooza for hours in the sun and now you need to cool off that burnt skin. You know it’s illegal to dive into Buckingham Fountain (don’t ask) so instead you smile at the friendly Hilton security guard as you head on up to the eighth floor from the main elevator bank and follow the smell of chlorine. When you get through the automatic doors, there will likely be an empty check-in desk and an unlocked door to the pool just on your right. It’s big enough for laps or splashing with friends and you have the option between two different hot tubs. Just be sure to shower off some of that festival grime before jumping in. How to get in: Have a short backstory in your mind before you get here. These elevators are slow, so be prepared to strike up a conversation with one of the other waiting guests. I followed a group of 10 seniors into the lobby and may have stuck out a bit, so one of the bellhops asked if I needed help. I just asked what floor the pool was on. He answered me inquisitively, specifying that a room key was necessary for entrance. There was enough traffic on the fourth floor, though, that in less than three minutes, I was able to follow behind a family of five and split off to the terrace before they had a chance to say anything. 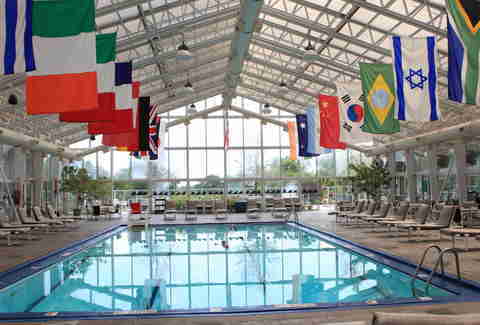 The pool is on the smaller side and had no lane dividers up, but the international flags above the water will make you feel like an Olympian. The real asset of this pool, however, is the garden terrace overlooking Michigan Avenue. There’s enough room to spread out and sun with your friends, but enough foliage to still feel like you’ve got some real privacy. How to get in: For being home to one of the most historic pools in the country, you’d think gaining access without paying would be Mission Impossible (at least a Ghost Protocol). Many sources claim the pool is on the 14th floor -- which is technically true -- but all you’ll find when you get there is a locked French door with a slight view of the indoor fountain. In reality, you’ll want to head to the “FC” floor where you will likely get stopped by the desk attendant to sign a waiver before heading up. I didn’t exactly read the waiver, so you may want to use a little more discretion, but she thankfully didn’t make me write my room number. The pool itself is amazing. The stadium lounge seating, leaded glass, and original accent fixtures takes you back in time. How to get in: Head up to the 17th floor and if you’re lucky, the pool and terrace area won’t be overtaken by a post-conference reception for the American Pavement Association. Instead, you will find a few young professionals unwinding by swimming laps at sunset. If you can’t get someone to let you into the pool with their room key, though, you can always head out to the terrace to grab another drink and maybe network with members of the Midwest Trash and Sanitation Union. How to get in: Getting into the Trump pool is as easy as channeling The Donald himself (at least the parts that aren’t virulently racist). Just pretend everyone else is below you. From the moment I hit the valet stand to the time I entered the posh locker room, I held a fake conversation on my cell phone. I rushed past the bellman, inquiring what floor the pool was on, took the elevator up to 14M, sauntered past the two fitness club desk attendants without so much as a “hello,” and finally through the long stretch of windows overlooking the city. The whole charade made me look important enough not to be bothered or questioned despite my fashion choice of cargo shorts. Inside you’ll find a quiet three-lane pool with floor-to-ceiling views of sailboats on Lake Michigan. There’s also complimentary cucumber water, but if you really work up an appetite, you can always order a poolside filet mignon and a glass of Veuve Clicquot Ponsardin -- each only setting you back $45. How to get in: Soho House has a sweet lobby, aaaaaaand that’s about as far as I got. With one of the newest, sexiest pools in Chicago featuring a 60ft pool and gorgeous views of the Chicago Skyline, Soho House is unfortunately also a private club with membership costing thousands of dollars a year. The pool is up on the roof and there is no way up there without checking in with the gatekeepers in front of the elevators and only accessible stairwell. I have a friend who works as a server in the lobby and she couldn’t even get me in, saying my best shot was to scale the walls like Spider-Man. So, short of being bitten by a radioactive spider, you’re not swimming here. -- each with their own hot tub -- and a 3ft wading pool for kids. Not to mention four usable gas grills, a fire pit, modern cabanas, and expansive wrap-around views of the Navy Pier and the city following a winding fitness track. This pool has it all! The only catch? The two elevators require a room key for access to any floor. Time it correctly, though, and you’ll find yourself heading upwards with a family or two that can help you out. I simply asked the father if I could use his key to hit the third floor and, much to the chagrin of his wife, he let me up without a hitch. That dad gets it. How to get in: Don’t be fooled by the signs directing you to the third-floor pool and spa just on your left as you enter the building. These really take you up to the hotel’s giant public outdoor bar and patio (it’s gorgeous, but you won’t find anyone swimming). To get to the pool head through the lobby, take a right down the hallway, and then take those elevators up. Unfortunately, you will need a key card to get in once you get there. The hotel is newly opened, so there’s no pool check-in desk just yet. If you find yourself waiting by the door without access for a long time, you can always head back to the patio bar and make friends with one of the hotel patrons who will lend you their key after a few drinks. Heck, it may even make for a more interesting swim for you and your new friend who appreciates you for being a chlorinated Robin Hood. 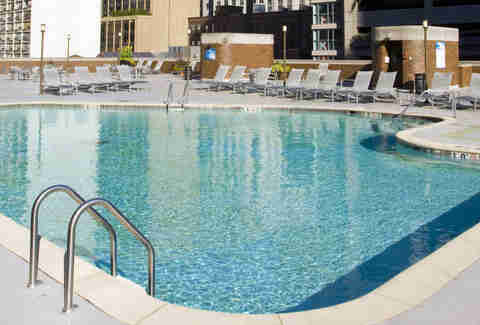 How to get in: This round rooftop pool lacks the privacy of many others on this list, being dwarfed by the surrounding high-rises, but the flip side to that is the laid-back security. Take the elevators opposite the check-in desk to the fifth floor and run almost directly into the pool. On a busy day, guests will be coming in and out almost routinely and you’ll be able to follow behind someone with a room key. On a slower day, though, you may find hotel staff holding the door open without a word as they head in and out of the deck’s storage room. If you can’t get into the pool, you can always head back to the lobby and ask the desk clerk for a free warm cookie to drown your disappointment in chocolate and walnuts. If you’re allergic to nuts, though, then you’re really out of luck. How to get in: Head straight past the concierge and take either elevator bank to the seventh floor. At the end of a very complicated hallway of offices, following signs to the fitness center, you will end upon a locked double-glass door looking directly at the gym equipment. From here, you have a few options, the first of which being that a hotel guest inside will get up after a set of leg lifts and grab the door for you. If that doesn’t happen, be patient. After about seven or eight minutes, an obvious runner came up to use the gym and I followed him in without any exchange or question. Swiftly head on through the locker room and you’ll come into a serene two-lane pool with amazing views of the Chicago River feeding into Lake Michigan. The pool is warm, the lighting is calm, and the plastic “wicker” furniture is surprisingly comfortable. How to get in: The pool is up just one flight on the second floor and while there are stairs, the elevator doors will open right in front of a complimentary coffee bar. Turn right around the railing and you’ll ultimately come to the locked pool door. It’s an indoor pool and there will likely be a number of kids splashing around while their parents read. Despite how many times one of the adults looks up and makes eye contact with you, they will not let you in. Maybe it was being alone or maybe it was my blonde mustache, but neither aided in my swimming quest. Ultimately, after the mother of one child pointed me out to her husband and I saw him take out his phone, I took off. I didn’t want to wait and see if he was calling the cops. I bolted for the stairs, grabbing a cup of French vanilla on my way out. If you’ve got some kids with you, you might have better luck. How to get in: Once inside the lobby, take a left towards the Weber grill, the elevators will be on your right. On the 12th floor, you’ll find a locked door to the pool and gym requiring a key card. There’s little chance you’ll be able to flag someone inside to let you in as there is a wall blocking view of the pool and none of the gym equipment faces the door. There is a chance, however, that a number of hotel staff members will be roaming the halls cleaning up after meetings and conferences. I first asked a staff person if he’d let me into the pool, but he claimed to not have access to the pool himself. Things were looking grim. But the next gentleman I asked immediately walked over to the door and opened it for me without any concern. The area is a bit tight with several families playing about, but there was a yet-unused hot tub, lots of comfy couches, and a wall of pines for privacy. 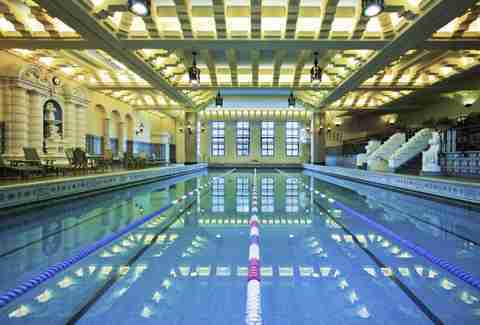 How to get in: For decades, the Four Seasons name has been synonymous with luxury and the Chicago hotel’s pool skimps on no expense. Take the first elevator up to the lobby, then head to the right behind the concierge desk and down the open seating areas to find the elevators up to the spa floor. Upon exiting the elevator, you will be met with a smile by the spa clerk. I said I was meeting a guest in the pool and the name I gave her didn’t match anyone who already checked in, but she let me through anyway without batting an eye or making me sign anything. She simply said that maybe they snuck through when she was away from the desk. That kind of trust is the epitome of luxury. Head into the locker room, past the wet sauna, and you’ll find an amazing pool with thick columns, skylights, cushy furniture, fresh fruit-flavored water, and more! It was like a beautiful recreation of England’s Roman Baths. How to get in: This is the only pool with enough security that I got caught sneaking in. I was close, though. Very close. I walked in, went up to the lobby, b-lined for the main elevators, and hit the 20th floor up to the famed spa. It has its own elevator call button and everything. Immediately upon exiting the elevator, I ran into three desk guards asking how they could help me. I told them I was meeting a friend who was a guest of the hotel (it had worked before, right?). They had me sign in with my first name, my friend's full name, and my signature. Then they simply let me go down and see if he was there. I thought I was scot-free. walking through the pool area, to the outdoor deck pretending to look for him. And when I turned around to see the pool once again, I saw the desk agent following after me with my signed release in hand. They either didn’t like my handwriting or they checked the name in their database. I said I didn't see him and she told me I could come back upstairs and sit on the couch next to the desk to wait for him. I pretended to text “him” while actually texting my girlfriend in case I never saw her again. Eventually after a long 11 minutes, I told the guards he was in the lobby restaurant and I left to go meet him. Scared and dry, I disappeared as quickly as possible.